McLaren was killed in a car accident in 1956. 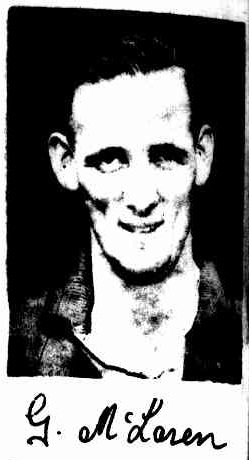 LIKE so many other Footscray players of note, GEORGE McLAREN came from the Footscray District League-one of the biggest and best managed junior organisations around Melbourne. 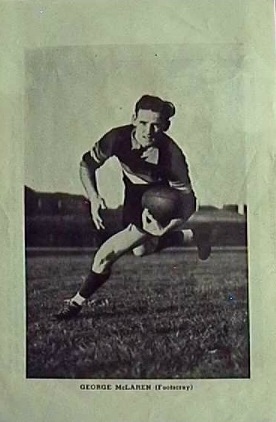 George won the best and fairest trophy while playing with South Footscray. He went into the senior side in the sixth game of his first year 1944-and has rarely missed a game since, except through injury. Up to the end of last season he had 108 games, and has played for Victoria. George's evasion, his pace off the mark, and his delightful passes, with long drop-kicks, . are features of his play. He moves so well with the ball that he has kicked a few goals with that fine running drop-kick. Though he is known everywhere as "Binger," nobody quite knows how he got the name. It is said to have been handed down from an elder brother, and is believed to be associated with Bing Crosby. George is well liked in the club, because he is a cheery individual, taking the rough with the smooth. "Binger" is also keen on his cricket. He is the wicketkeeper for I.C.I., which won the premiership of the Footscray District last year. He has also kept wickets for Yarraville Sub-District second eleven. ' Married, with one child, he lives at Sunshine, where he is building his own home.